Well, I guess it is February, after all. But I can help but feel this is a little bit of Karma. We’ve had such a mild winter up till now! Weirdly mild. And I LOVED it. I even started to brag about it. I began to dream about an early spring. Maybe even a longer than usual growing season. And then, BAM! Winter! 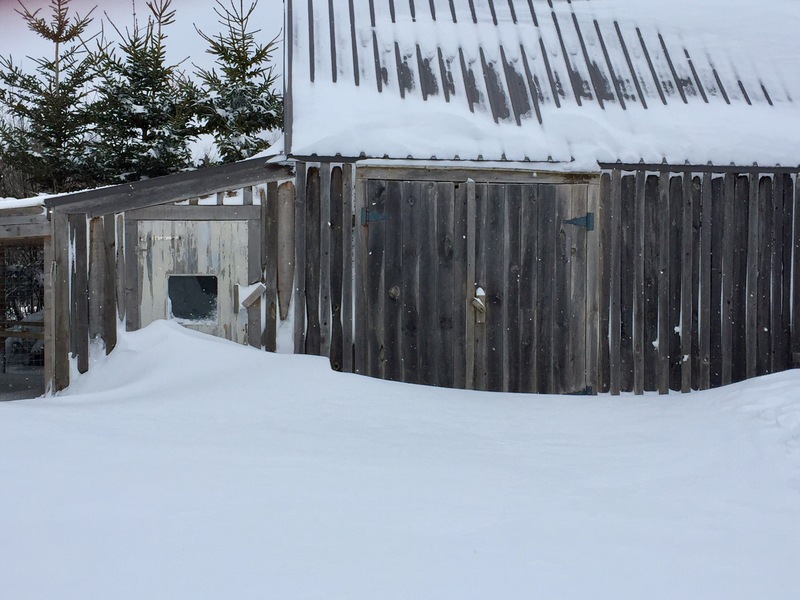 The past seven days have brought 3 snow storms and dumped about a metre of snow. 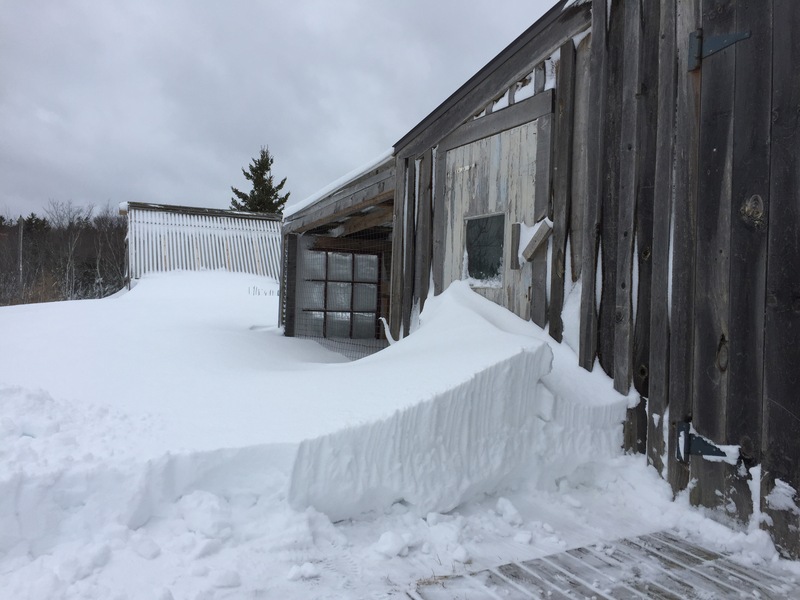 It’s hard to know exactly how much because most of it fell “sideways” as it was accompanied with strong winds blowing the snow all over the place. 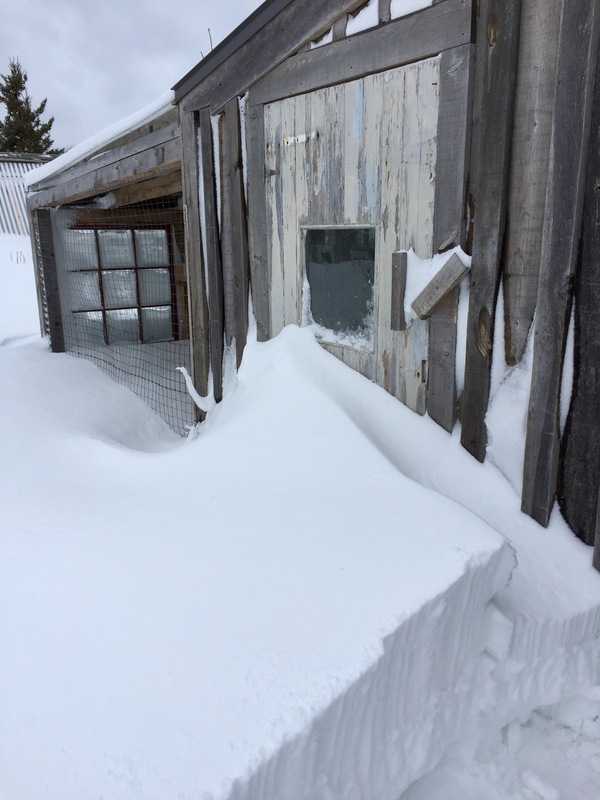 Mondays blizzard came with winds that gusted around 120 km/hr. 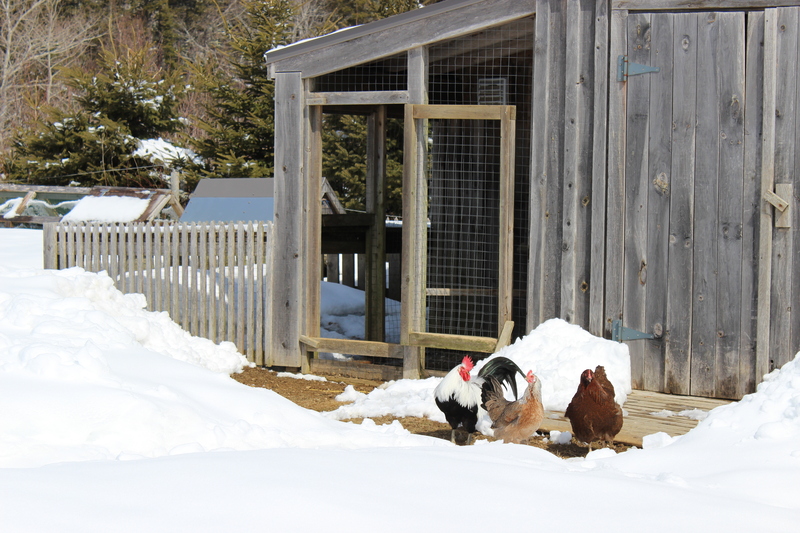 Yesterday, I dug a path to the chicken coop, which suddenly seemed really far from the house. This morning, my path had completely disappeared. Last nights snow fall filled it all back in. 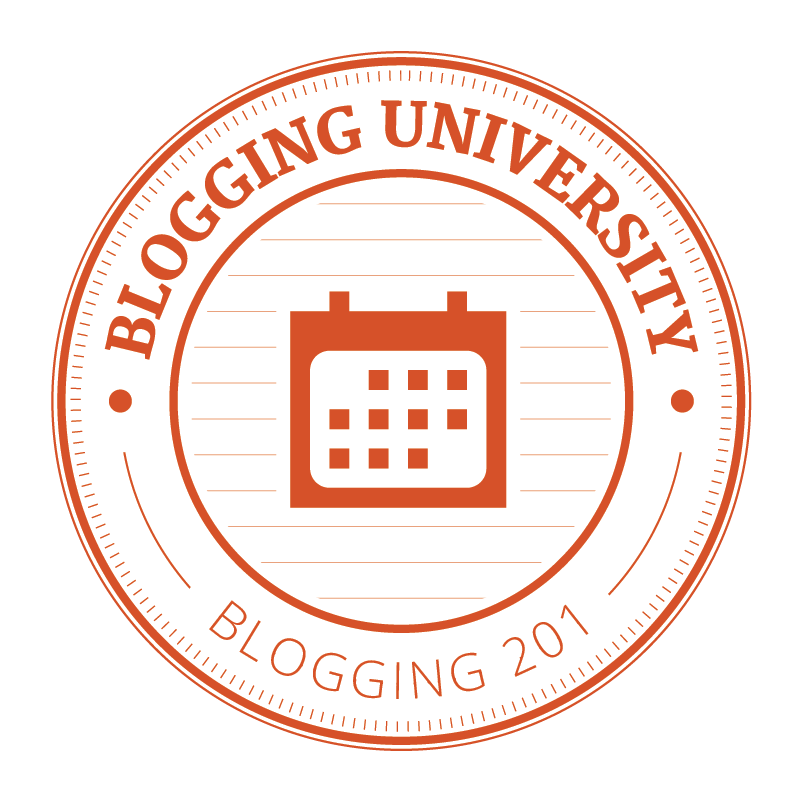 So, back at it. As I drew closer, rapidly loosing steam I must add, I could the hens inside cheering me on. I’m sure they were! They were rewarded with some extra cracked corn. And I got some eggs. The positive thing (the ONLY positive thing) is that all that snow provides a nice blanket of insulation over the garden. And I suppose, a slow melt will help to keep the water table healthy. But a melt, of any kind, seems a long way off. Because, right now, yeah …. it’s snowing again. 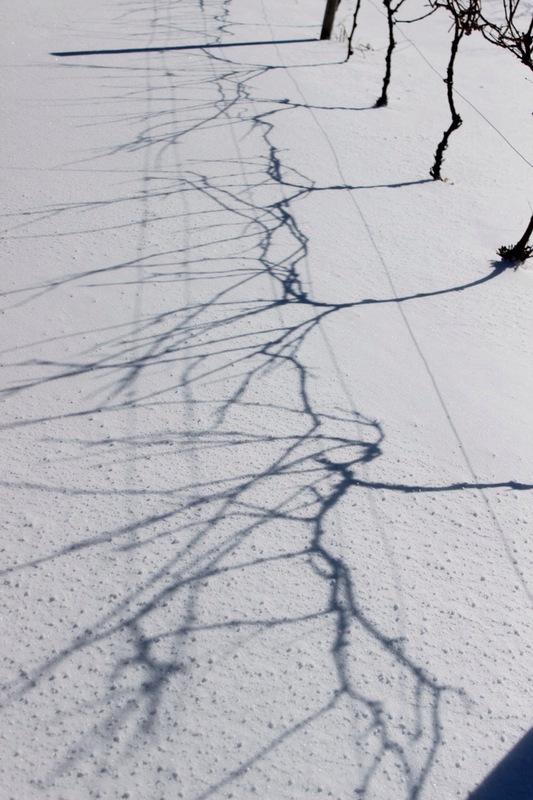 Long January afternoon shadows on the snow in our fledgling vineyard. Photo taken in 2015. Looking for a meal in a snowstorm. So, This Is Spring, Is It? 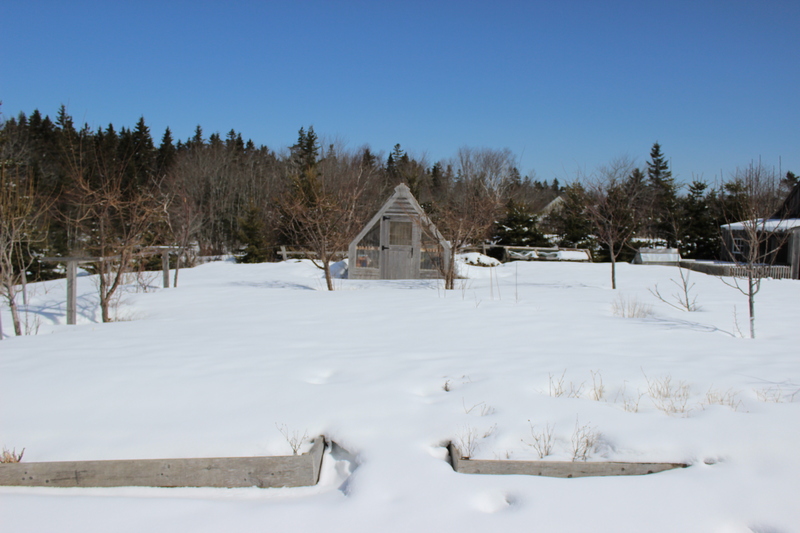 Julie, from the very lovely Frog Pond Farm tells us April is Garden Share Collective Month. Here we are one week into the month, and I feel I’d be remiss if I didn’t share my garden, poor thing. 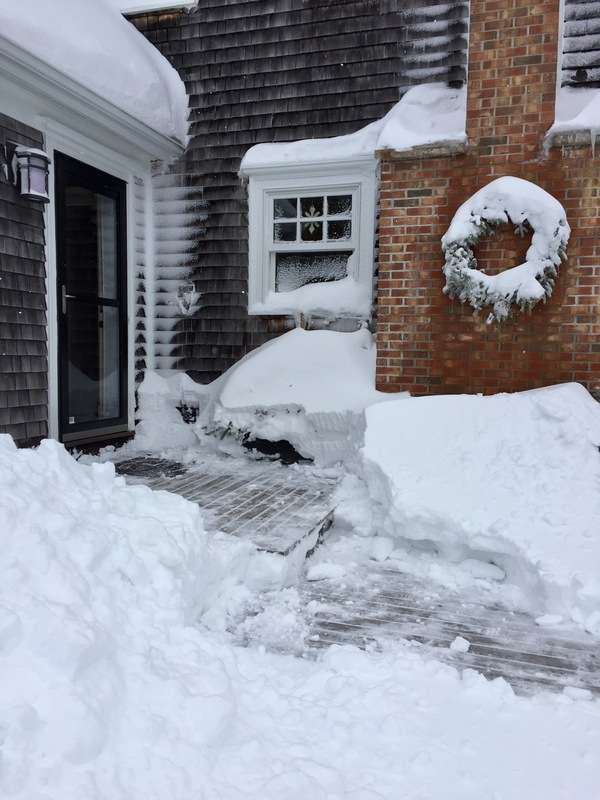 This is what happened here yesterday…… yup, another 15 cm of snow to add to the 350 cm or so that we have had since early February. 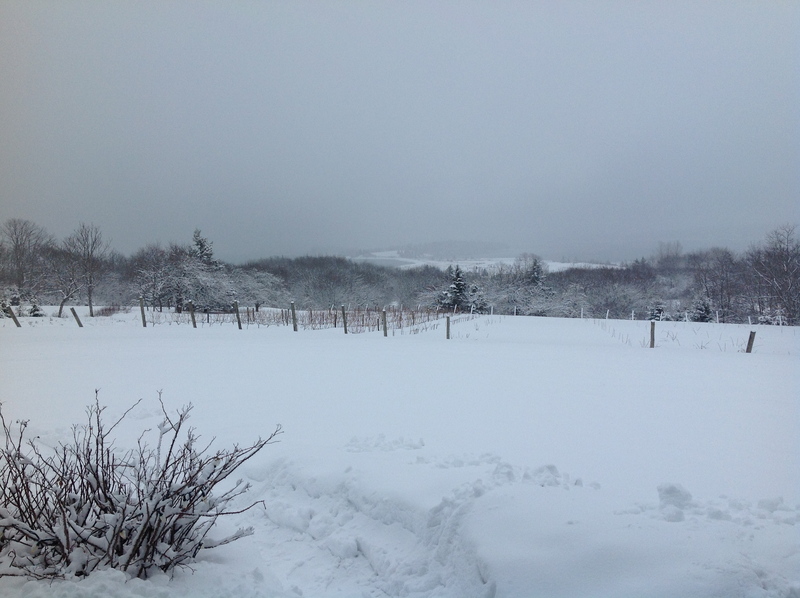 And this is the kitchen garden this morning. 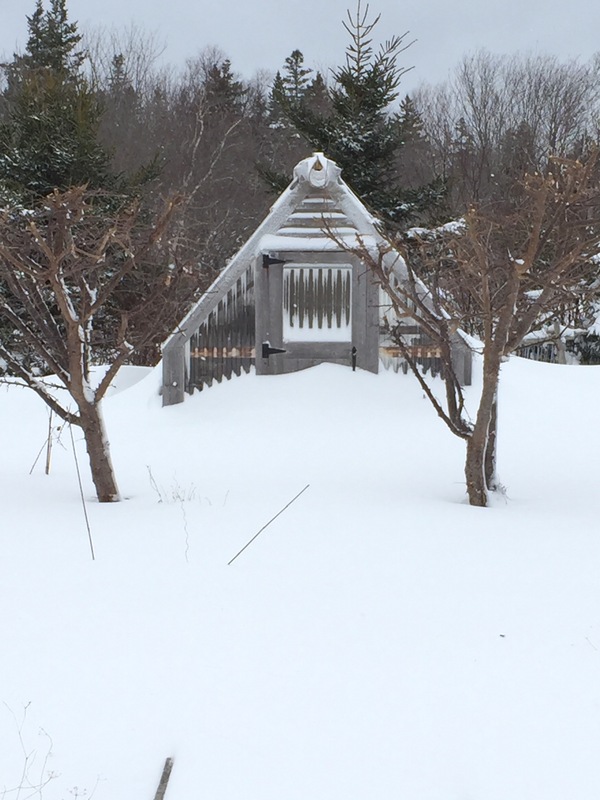 Under the snow are the raised beds. 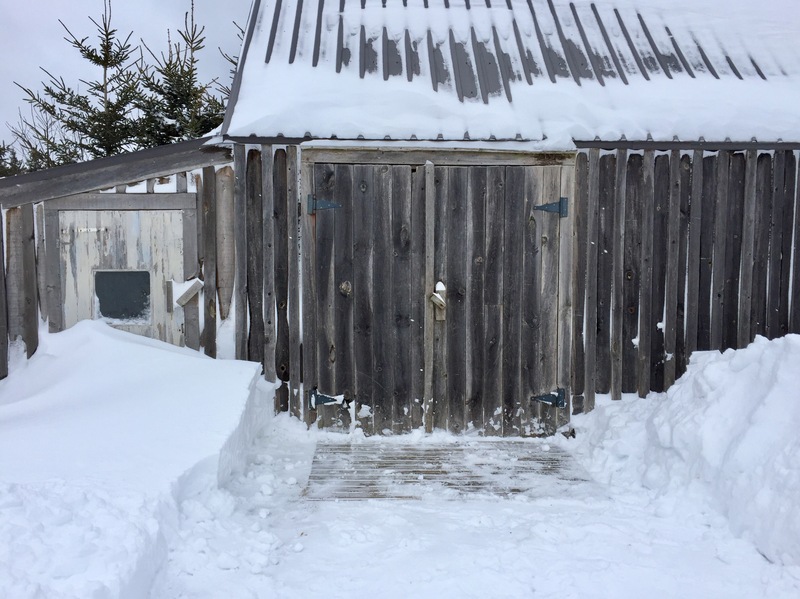 I guess I can forget getting into the shed for a little while yet. 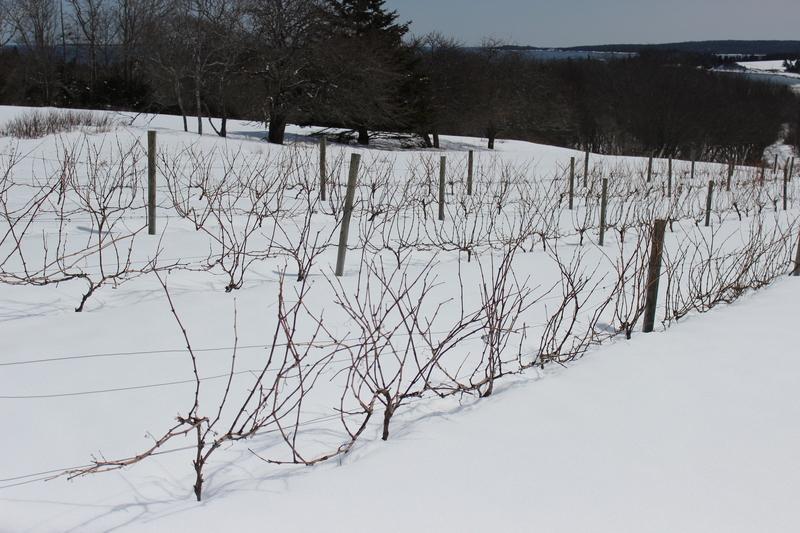 The grapevines should have been pruned a month ago, but instead, they are up to their armpits in snow. They will have to wait. And my poor chickens are desperate for a patch of bare soil, bless them. It’s a very sad story, I know. But it is not all doom and gloom – not at all. Gardening is for optimists, even at the best of times. 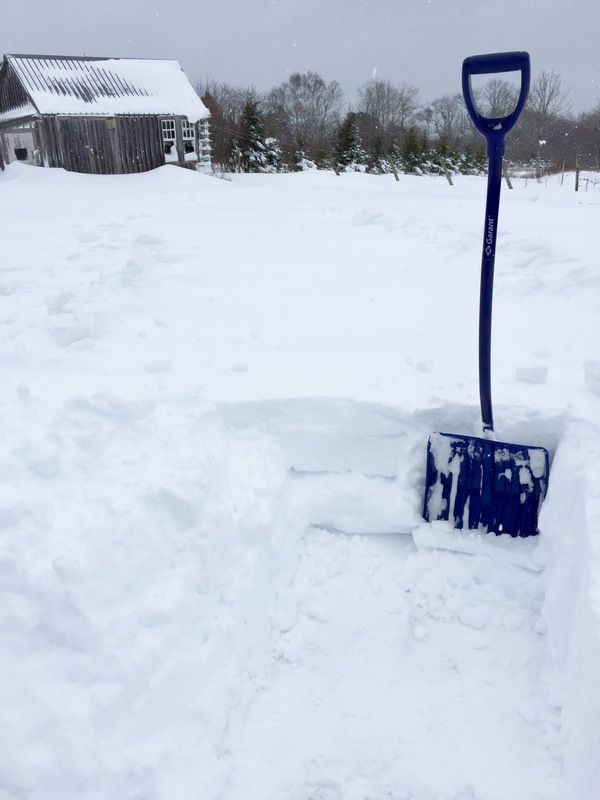 All this snow pretty much guarantees us of a full and healthy water table this summer. That’s very good news. And, hurrah!! 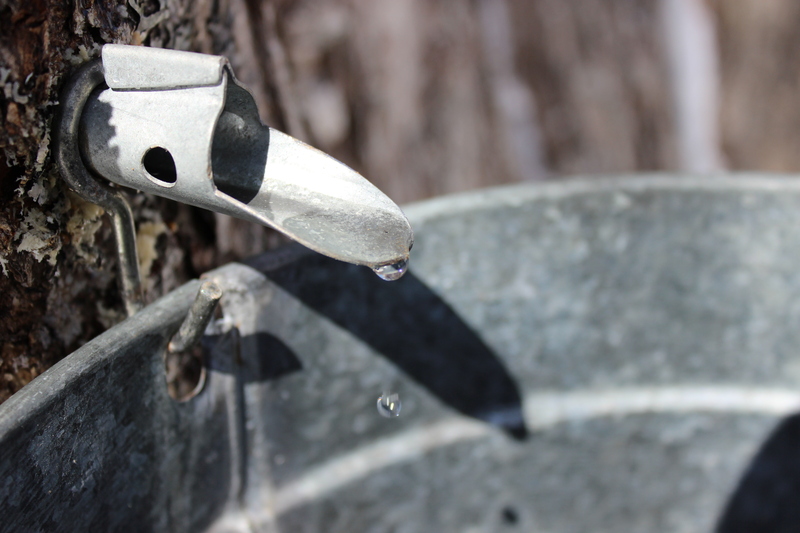 The maple sap has started to run…. albeit, about three weeks behind schedule. And under the grow lights, the tomato, pepper and onion sprouts are encouraging me everyday. 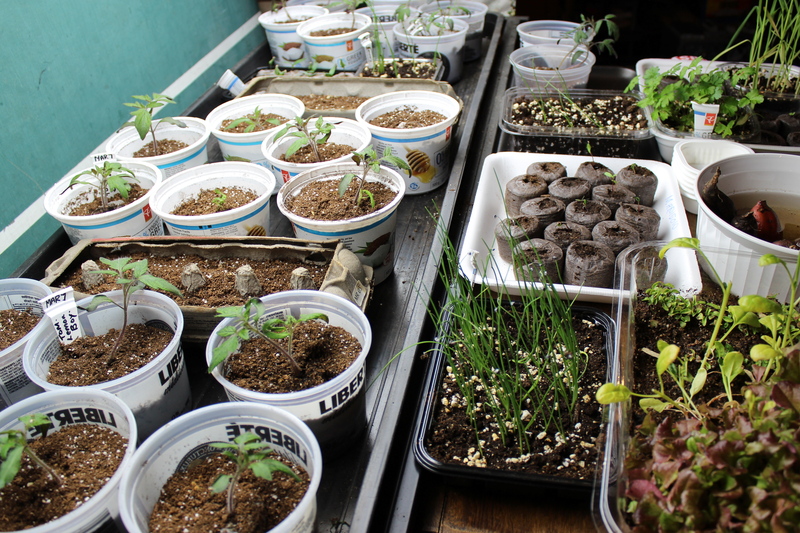 Since I can’t access the my pots, which are in the garden shed, I’ve been using yogurt containers, egg cartons and other recycled items to start the seeds. So far, so good. Wishing you all, Happy Gardening, where ever your garden is.